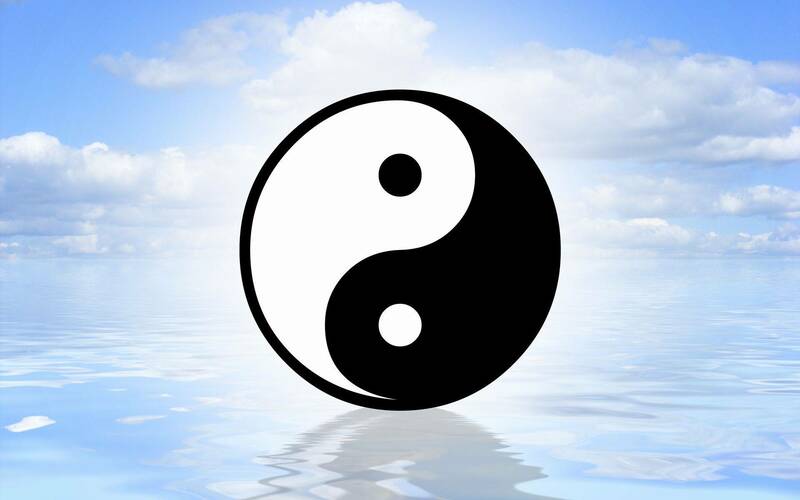 Martial art films ,you either love them or have no interest in them at all, for me it was the mystery of the arts that got my attention ,my brother was into the films and did train in Karate in the 70's and early 80's.. It was this that got me and my friends interested , with frequenting the flea-pit cinemas around North London, they often showed badly dubbed Hong Kong and even worse dubbed Taiwanese films . But that was the magic of it all, If we where lucky we find a cinema showing the Bruce Lee films uncut or some classic Shaw Brothers ,still mostly dubbed ,but the Bruce Lee ones where always subtitled making them authentic. When the VHS boom hit in the 80's and I got my first job ,i got myself a VHS player and rented as many martial arts films as I could , many where still poor excuses for action in the fight stakes, but it was Jackie Chan's Battle Creek Brawl or Big Brawl to many, that got my attention ,me and my friend saw it at the cinema and where taken back by it ,even though the story and some of the scenarios where a bit lame ,it was Jackie's prowess on screen that shined through. 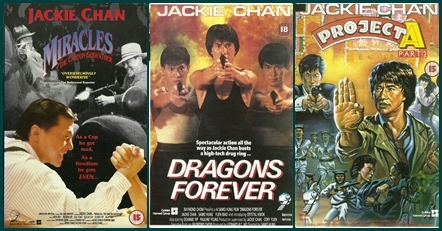 Now this led to me tracking down everything Jackie Chan ,starting with the release of The Protector , I rented my copy of this film from my local video shop,this time I could see Jackie in a more serious role ,again his ability astounded me ,the film which for the time I thoroughly enjoyed left me wanting more. 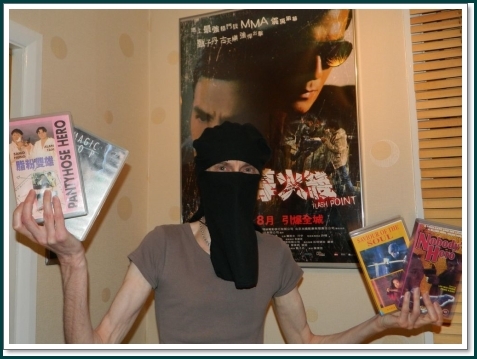 The Old late night films had left me wanting that honour and respect lacking in the American action films around this time , then a film would come to VHS that would totally convert me to Hong Kong cinema. 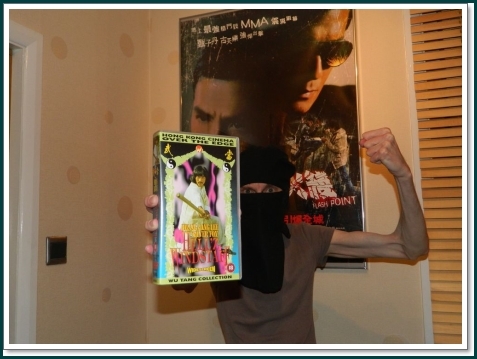 Palace video if I remember rightly released Jackie Chan's Police Story on to VHS in the UK. Being one of the first if not the first at my local emporium to rent the title ,i was so excited to watch Jackie in action again. But nothing could prepare me for the blistering fight action and death defying stunts performed on screen and all with out takes at the end to show how hard these guys work. In fact the film finished and it went on again , just because I wanted to check that I actually saw what I just witnessed. Of course the next day I had to return the rental ,now Police Story made Jackie so popular in the UK that Jonathan Ross dedicated a whole episode of his ''Incredibly Strange Picture Show '' to Jackie Chan. .
To hardened fight fans Jackie had arrived in the UK video rental charts and popular martial arts label VPD got rights to release some past films of Jackie's back catalogue ,as well as some future ones to. Now the next film of Jackie's to come to my light was of course one of Jackie's biggest UK hits on VHS. Yes the Asian Hawk had landed as Armour of God had hit the shelves. Once again this film showed me that Hong Kong cinema was entertainment overload and I needed to see more. It didn't take long before the likes of Project A,Winners and Sinners,Dragons Forever and more hit the video rental shelves. 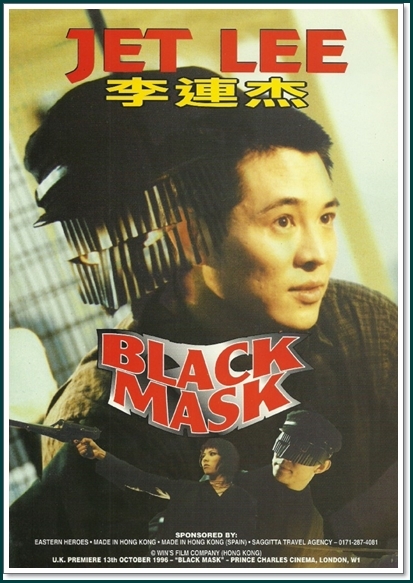 Now with these films many where introduced to the likes of Sammo Hung, Yuen Biao ,Yuen Wah and others . This led to people wanting to see Sammo Hung and Yuen Biao in films . The release of Above the Law paired Yuen Biao with the likes of Cynthia Rothrock who had also been in Hong Kong making films after getting scouted by Golden Harvest. Sammo Hung had given her the chance to star in Police Assassins aka Yes Madam aka In the Line of Duty . This film was popular because of the first because it paired Cynthia with Michele Yeoh (then Khan) , Michele Had gone to Hong Kong to star in films ,she was originally at the Royal school of Ballet but due to injury her dancing career came to a abrupt end. Now Films where coming out now and again, but then I heard of Jackie's magnum opus ,''Mr Canton and Lady Rose'' aka Miracles. I just had to get this film, advert in a martial arts magazine caught my eye , the JCFC advertised the ability to get Hong Kong films and being a Jackie fan I had to know more. I wrote to them ,and got list of films ,Miracles was available (of course these where bootlegs ,most films at this time where just not released in the West ) , the JCFC run by Ricky Baker was a source for all things out of Britain’s then crown colony . Not going to mad I ordered a couple of films , of course due to being bootlegs the transfers where not brilliant but they where watch-able ,but then put any VHS nowadays and your probably go ,how the hell did I ever watch these tapes (where just spoilt with DVD and Bluray now) , but this connection with Rick Baker led to finding out about his Cinema events ,held mostly then at the now defunct Scala Cinema in Kings Cross. Now the Scala was quite a large cinema and held a big crowd.,the cinema was run by enthusiasts of Cinema and on event days which often played host to two or three films ,the foyer of the Scala upstairs held the Cafe area and a large enough floorspace for a few stalls selling Film,Posters and more. At The Back of the Scala cinema , the best place to view all films. Rick and his cohorts would be set up with a good array of films for sale, picking up the latest films in Hong Kong or some older classics, there where always someone selling film posters ,which where quite hard to come by. Now with these events one thing was paramount ! Audience participation. ,Films would play and and the fans would whistle and clap and shout at the screen when the fights happened or their favourite star appeared on screen. I must admit after one of these events who needs a workout. Now if you attended any of these shows ,then you know if a show happened where a star would appear then the show would sell out and the noise from the crowd would be deafening. 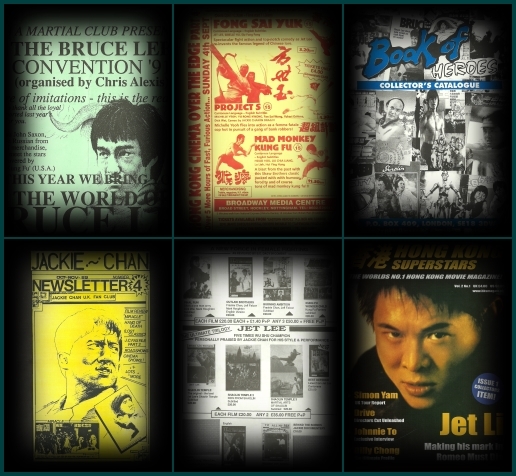 The JCFC eventually became Eastern Heroes as Ricky Baker was focusing on all types of Hong Kong cinema from Gunplay films,Vampire Horror ,action as well as Martial arts in genre. I managed to see some great stars at events Eastern Heroes arranged, many in conjunction with Bey Logan and his Beymark International group. 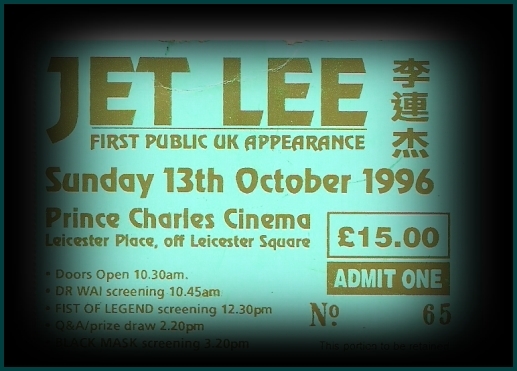 I didn't get to all of them ,but I did see Donnie Yen,James DeMille and Chow Yun Fat at the Scala. After the Scala closed due to them showing the film Clockwork Orange and going into dispute with Warner Bros. Legal costs soon put a end to their run. It was sad day the Scala closed ,Ricky Baker had even set up a little shop just outside the foyer as you went up the stairs. I used to just visit the shop when he was there. One man that was involved with Ricky was Toby Russell (son of the late Ken Russell) , I remember they had offices just off Oxford Street where the films where done. I think I was one of a select few that visited those premises. Now also in Ricky's band was one John Brennan who helped Ricky run the show, John is a traditional Kung Fu Fan and was always around and we became good friends , funny enough I caught up with John when I visited Birmingham for a martial arts show back in 2012. I was amazed to travel to Birmingham to see someone I had not seen in years, crazy when we both come from London. 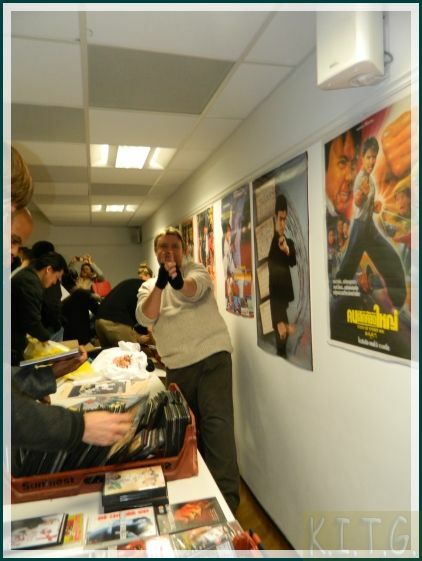 For the many fans that frequented the events and screenings all those years back , each event was piece of History to Kung Fu cinema in the UK. 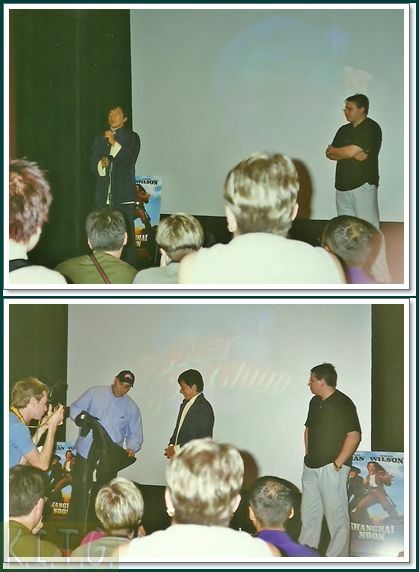 I myself have many memories of the shows , from the screening of Pantyhose Hero with Sammo Hung , I remember Rick saying at the time he was unsure about how the crowd would react to the film being that it was set undercover cops in the Gay community. The film is basically not available on DVD or Bluray in today's market ,but was released onto VHS for a short while by Rick Bakers Eastern Heroes label..
Today many may think it a homophobic film, but in all honesty if you don't like something don't watch it I say. Of course at the time the film went down a treat , especially when Sammo bust some heads ,the crowd went wild in the cinema. I also met James De'mille ( student of Bruce Lee) at another event and actually got chatting to him for a while ,before I actually new who he was, I was quite amazed when later in the day Rick announced on stage that James De'mille would perform Bruce Lee's one inch punch on stage and the guy I was talking to earlier came on. 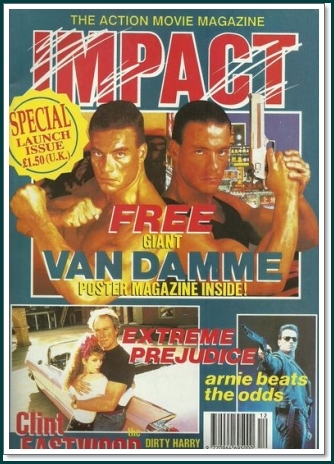 And who can forget the Screening of Jean Claude Van Dammes Double Impact to tie in with the release of Impact Magazine . The very first issue of Impact. Come on now .whose still got their ticket? We waited outside for some time , then followed in a Lion dance straight into the cinema ,what mental times., it was so loud in there. Of course after the demise of the Scala things had to move on , the guys opened a new shop in Camden and then in London's Shaftsbury Avenue. 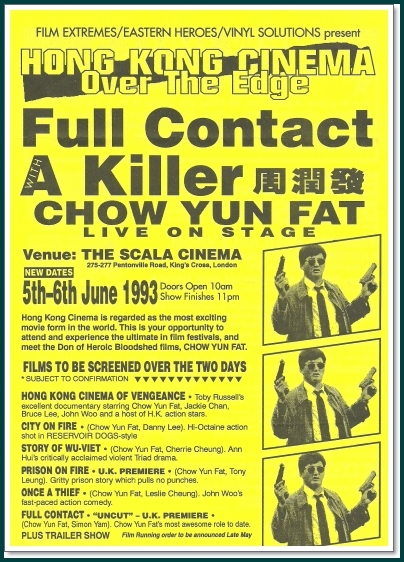 The last big event at the Scala was the weekend double with Chow Yun Fat appearing , I was only able to attend on the second day , but with three films on show and Chow on stage for a raffle and a Q&A it was really something. Now i bet brings back some memories! 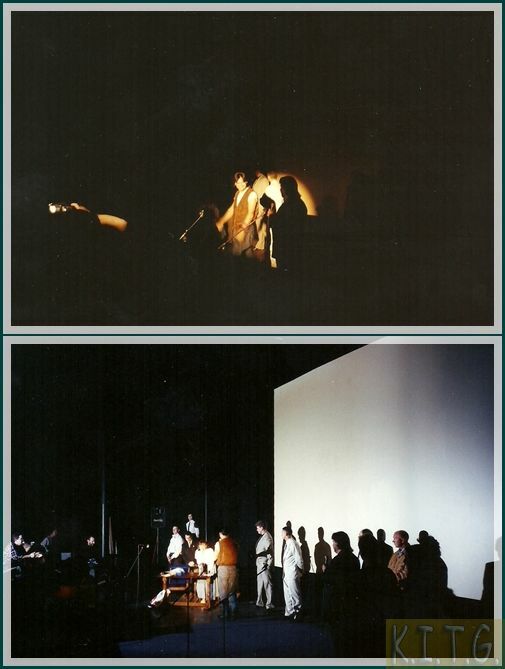 This did not stop the events though with a screening of classic ''Snake Deadly Act '' at the Prince Charles cinema to celebrate the opening of the Shaftsbury avenue shop. Even Jonathan Ross came along to cut the ribbon in some crazy jacket. The Prince Charles also hosted another two big events for Eastern Heroes , first was the appearance of Jet Li in the UK. 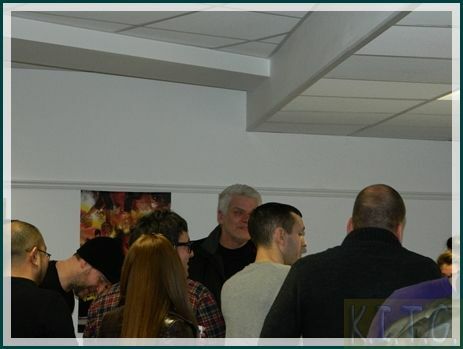 Which literally brought Soho to a standstill when fans found out who was in the cinema. 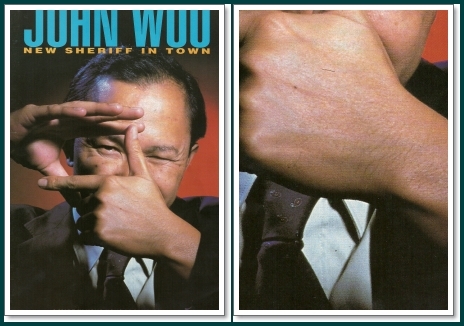 Next was the appearance of John Woo along with his friend and cohort Terrance Chang , They screened the new Van Damme film directed by John Woo , Hard Target . 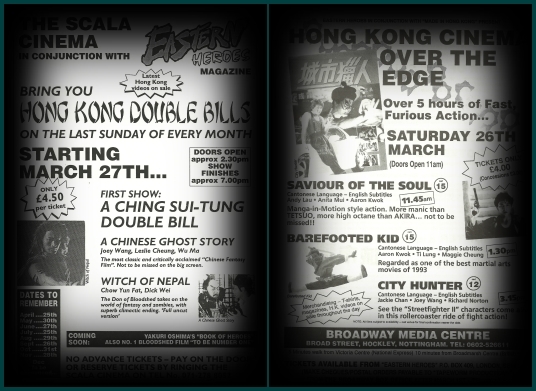 Eastern Heroes also put on some shows in Nottingham, I actually went to one just to see Jackie Chan's Drunken Master 2 after missing the London screening. We all decided that the crowds up north where very quite and John Brennan,Chris Mercer and others along with myself decided to get things going during the fight scenes. 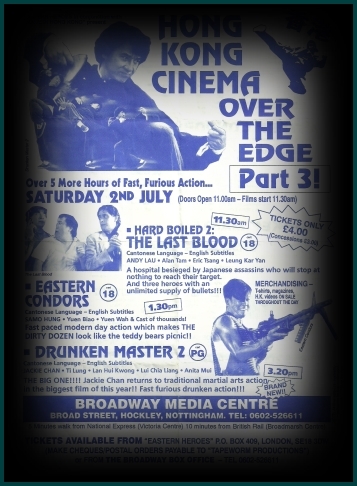 But Eastern Heroes was also a Publication which reviewed many films and had features on the stars , it was really the only dedicated Hong Kong cinema magazine in the UK. Though Bey Logan's IMPACT Magazine incorporated Far East cinema it also concentrated on Hollywood fare to. I think with the event of DVD and the more mainstream Hong Kong cinema became in the UK it got harder to secure films to certain labels, the big boys start setting up there own labels and steal the market share to a degree. Also importing DVD or even VCD which was a standard format in the east became easier , as most DVD players played VCD it was easy to get the latest Hong Kong films on VCD for around £8- £10 right in London's China Town. 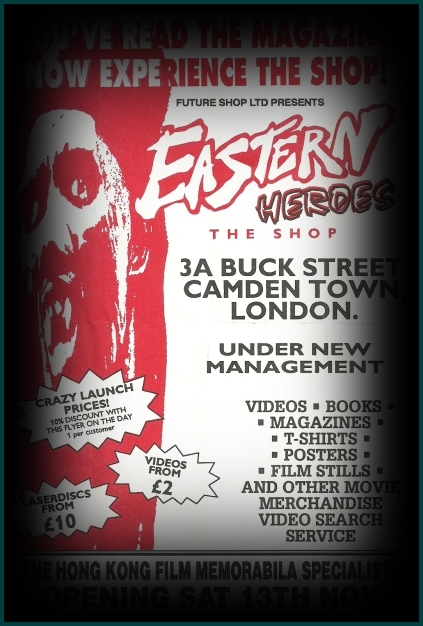 This was where I got most of my films for a while after the demise of the Eastern Heroes shop. Then of course with the event of the internet becoming more a shopping place then just a place of information , things changed again there are many online sites which sell the latest films months or even years before they find a Western release . Of course here at K.I.T.G. We champion YESASIA and are affiliated with them. Now we come full circle the year is 2014 ,it's been some years since those heady days. But last year Rick Baker has returned to the scene and is relaunching a new Eastern Heroes Magazine this year. 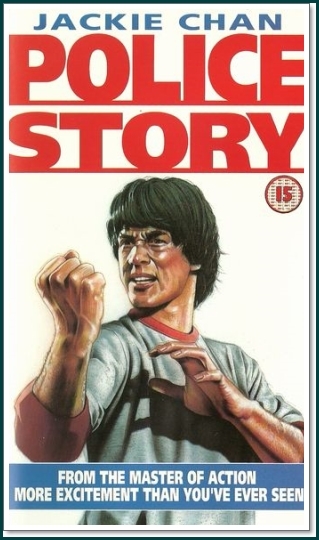 We attended a event last December in London's China Town , with a screening of two documentaries , one on Bruce Lee by Steve Kerridge and Toby Russel's look at the Venoms Group from Shaw Brothers . 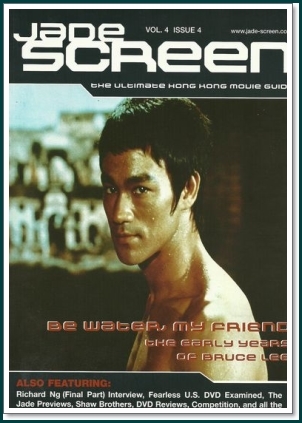 Toby and Steve Kerridge also released new books on Bruce Lee and classic film posters . 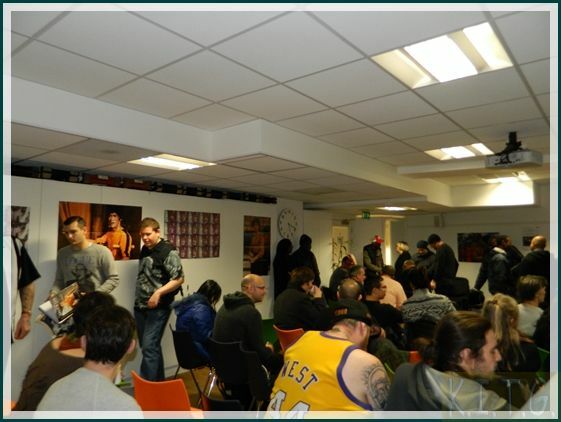 The event was packed and I think we where over the fire hazard limit as we all squeezed into this tiny room. Definitely brought back some memories. 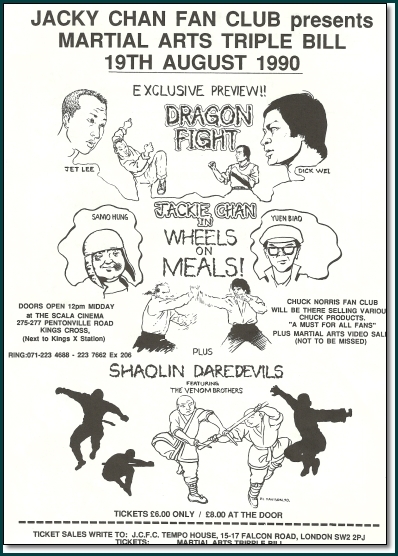 Of course back in the day it wasn't just Eastern Heroes that offered crazy cinema events , Rick Baker initially was in partnership with Chris Alexis , another fan of Hong Kong cinema, but due to differences they set up on their own..
Chris Alexis concentrated more on old school Kung Fu and Bruce Lee events and held a number of Bruce Lee events named Tracking the Dragon. Under his Shaolin Club / Martial Club name. 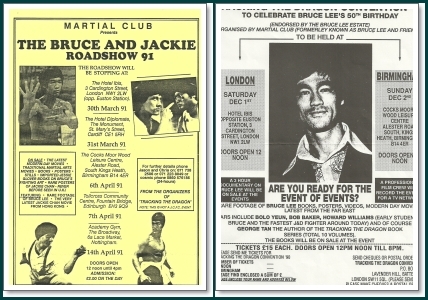 I only attended one of these events ,where they had the Bruce Lee estate bring articles from the Bruce Lee museum over ,including , the Game of Death tracksuit, the gloves he wore in Enter the Dragon at the beginning and even a death mask taken from Bruce Lee after his death . It was very surreal to see. I even got to try on the gloves that Bruce wore to , how cool was that, it was also the first time many got to see the uncut footage and out takes from the Game of Death . 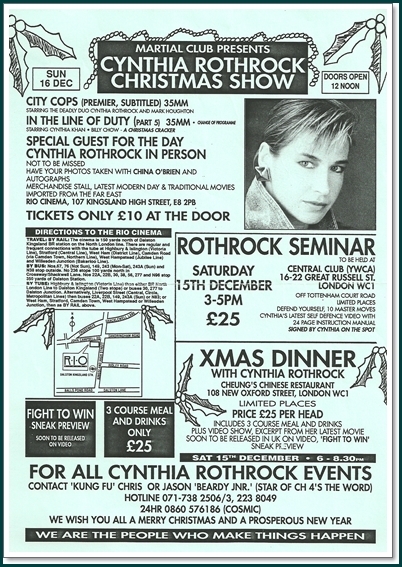 It was also a Shaolin Club/ Martial Club event where I got to first meet Cynthia Rothrock in London's Dalston .I think the main event was the film City Cops , but the second film was a film not associated with her,In the Line of Duty 5. Martial club's flyer for the Cynthia Rothrock visit. Who would ever think I would meet her again many years later again in 2010 in Germany and again in the UK in 2011. Shaolin Club also put on film shows mostly in Hotels like the Ibis in Euston, watching films on a projector screen , but it was a event where I saw one of my all time favourite films ,'' The Crippled Avengers'' and Lady is the Boss..
Shaolin Club also had a shop in Brixton where you could get some posters and films. On a more official note Richard Cooper became the official UK fan club representative for Jackie Chan for a number of years , until Jackie disbanded all clubs. 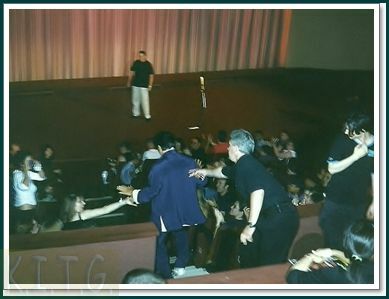 Richard Cooper put on some cool films shows and also was responsible for the setting up the fan club meet for Jackie and his fans when he attended the Shanghai Noon screening in London’s West End. He also put on a couple of Hong Kong visits for those who could afford it. 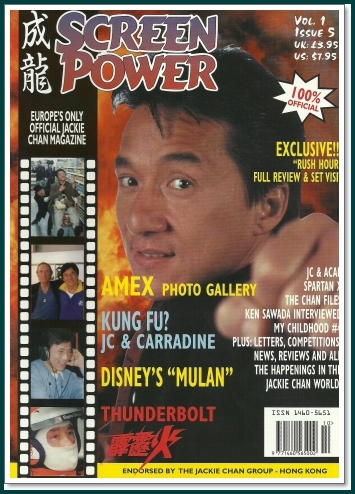 Richard Cooper also ran a Jackie Chan Magazine''Screen Power'' and a another magazine named Jade Screen for a while to . Jade Screen by Screen Power Publishing.This issue was one of those flip it and it's a Screen Power issue. Another guy who ran a Hong Kong fan film club ,was Chris Ducker around the time , all I remember was he had a little shop in a in-shops (now defunct) complex in Croydon Town centre. And also ran a magazine called Hong Kong Superstars. 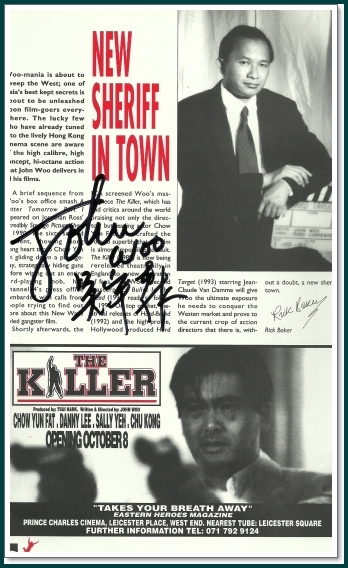 Anyway he put on a film show at the China Town Metro cinema in London in November 1999 , the event all though not a sell out , but I think maybe it was not advertised enough , But the event was the UK appearance of Hong Kong film star Simon Yam. Simon was great with the crowd and stayed around to meet his fans , after the on stage Q&A , I still have my signed copy of his film Cold War on VCD. 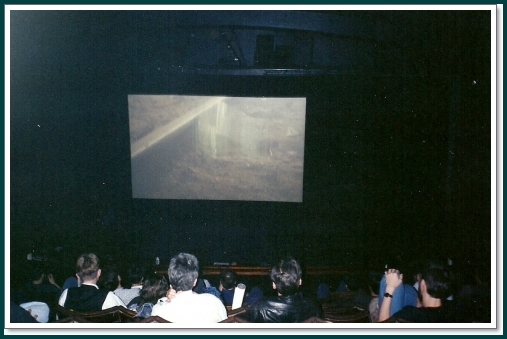 So for about 10 -12 years Hong Kong cinema In the UK was a mission , you scoured to find out about events and attended as many as you could, as you new for most part they where the only chance to get hold of some of the great classic films around that time. These days things are different , but we have some great events in London like the Terracotta Far East Film Festival and the London Korean Film Festival ,both of which showcase a vast array of Asian cinema and with guest stars in attendance. We Look forward to what the New Eastern Heroes will bring to us and the fans ,but I think those days back in the 80's and 90's where the Golden age for Hong Kong cinema in the UK. And if you where around in those days then you where lucky to be part of such a crazy time. And if you where not ,you have no idea what a time you missed. This is the Snake and I Tell it like it is. T-Shirts , we all like a good T-shirt ,but what better then some classic T-shirts with cool designs from the past. Have you still got Yours? 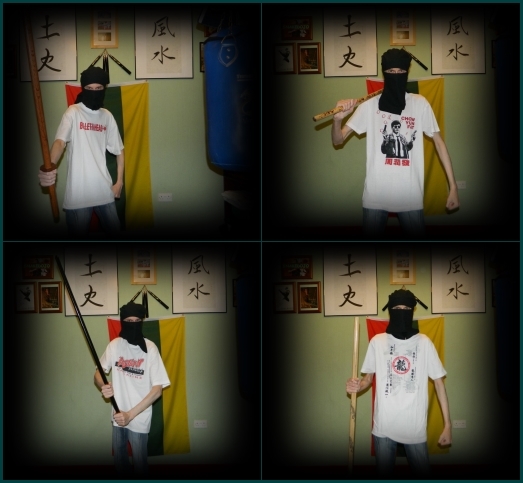 Left to Right- Bullet in the Head / Chow Yun Fat and Eastern Heroes T-shirts all by Eastern Heroes. The last one is a Official Jackie Chan T-shirt. Still got to Find my Drunken Master 2 T-shirt Eastern Heroes did as well, as soon as i come across it ,i'll post a photo or two. Here your find some stills and Scans of old Flyers and Brochures i still have after all these years. As well as a few photo's , unlike today with all the digital cameras ,i relied on old style film cameras , not all photo's came out well ,some where murky ,so on many occasions never carried one. Of course now when visiting a event i don't leave home without one. Hellz Windstaff in the Snake's Hand - haha 'What a Title that sounds like! Now in September 2014 Eastern Heroes is attending the Strength and Combat show at London's soccer dome , they have also secured a appearance by Korean super kicker Hwang Jung Lee ( Drunken Master , Secret Rivals) , Master Hwang is appearing both days on the 13th and 14th and on the 14th is also holding a seminar which we are attending to. Plus Ninja, Undisputed star Scott Adkins will also be appearing for autographs and photo's to on the Eastern Heroes stand. 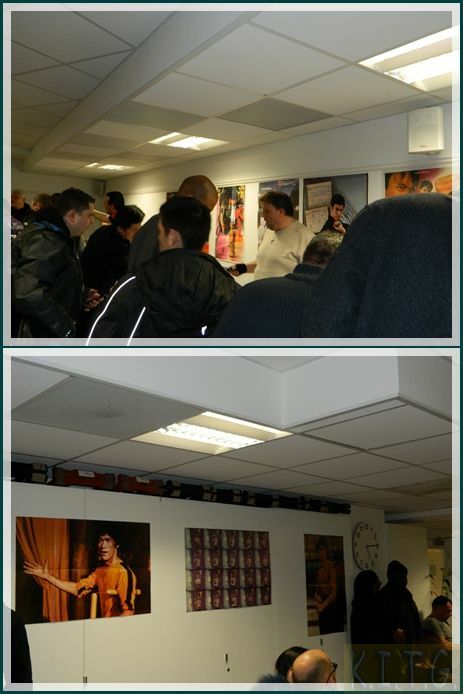 As well as having a special Bruce Lee event to . 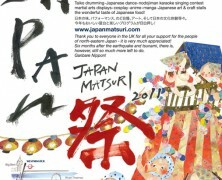 Look out for special feature on site ..